Not to be forgotten in our news cycle is the release of Android 2.3.4 which will start shipping to Nexus S devices in the coming weeks. By hooking up through your Gmail and Google Talk friends list, Android 2.3.4 is launching video chat whether they are on a compatible Android tablet or phone or over the computer. Video chat will (thankfully) take place over 3G, 4G and Wi-Fi connections. 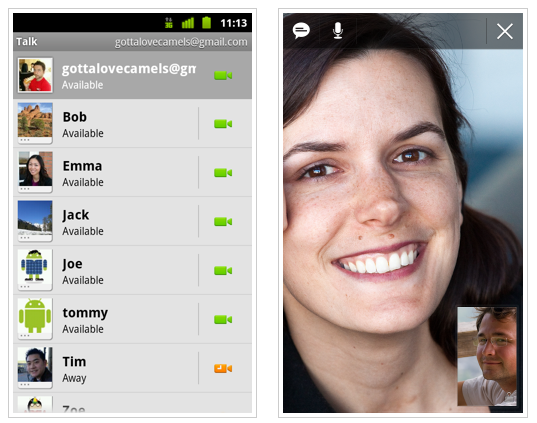 In your Google Talk friends list, look for the voice or video chat button, touch it and connect with the person! If you need to jump back into your homescreen for a minute, no problem as the video will pause and pick right back up when you re-enter the conversation. Check out the video below as Colin walks you through Google video chat. Android 2.3.4 is rolling out to the Nexus S over the next few weeks with other phones coming soon. Not bad. Not bad at all. Now just waiting on the rumoured update to the MT4G and all will be good in the world. I’m not one to cry “but why isn’t my phone supported”…BUT does anyone else thing Google should have waited a little longer then pushed this out via the market for any phone with a FFC. I’m not a big fan of the “F” word…but this doesn’t look good when Google tries to deny fragmentation. I know the Nexus S is the “developer” phone, so testing is done on that device…but its about perception. Still no Google hate from me…i’ll be waiting patiently for the CM team to push this out. I updated my Nexus S last night…woohoo! Did it update without a hitch? My Nexus S is updated. Video chat works great on wi-fi, but it appears to not work on 3G (forces you to turn on wi-fi. The release info said that it would work on 3G…if your carrier supports it. Wouldn’t you think T-mo would support it? How did you get it working? When I don’t have wi-fi running, I get a pop-up box “You must be connected to a Wi-Fi network to start a video chat.” and give the options to go to Wi-Fi settings or cancel. That weird. I did not have to do anything special. It just worked after I manually installed it using the link from Google. Video Gtalk working fine tween the S and the native Gtalk on the GSlate. Wifi only though. Tango is still my primary app since it works on 3G. Where is 2.2 for the G2!!!!!!!!!!!!!!!!!!!! We were promised that first. Once again lied to by TMO, What a shock! At least we will have better coverage when we are lied to by ATT and better phones. Cause thats what it is all about, right. Like the average user really cares. You have got to be kidding me. You all bought into the dual band hype tho i warned you. We will all get new phones from ATT. But the official 2.3.3 OTA update for the G2 (and MT4G) won’t be here until Summer. Would this work on phones without a FFC? Anyone know of any technique to use to turn your regular camera into a FFC besides trying to video chat in front of the bathroom mirror? I wouldn’t sit in the bathroom to do a video chat. I just have a new baby coming out in the next few weeks, and my in-laws would love to see that baby via video chat. My wife likes to skype with her family, but doing video chat from my G2 would be much more convenient. I think the real news here is that the dude in the video loves camels… why was this not covered? Well its a booooout time. Now I need 2.3 and a FFC that I didnt surgically implant into my phone. well i live in mexico and have this phone but the telcel verision. yes we got this phone in mexico for those that didnt know. well i also installed this update and over here video calling is working fine over 3g i dont need wifi. ive always taught cellphone networks in the US allowed video cAlling over 3G. cuz i taught u had had better networks thAn us. and that may be tru cuz over here telcels 3g coverage is crap 70% of its network is still edge only bout 30% is 3G theres only 3G in the big citys . u go outside the city u drop down to edge. but in the places were 3G is available like were i live in guadalajara it works and it gets the job done its fast i get 4-7 mbps up and 3-5 mbps down and video calling works fine over 3G. so yea i was thinking that maybe its a t-mobile thing? maybe t-mobile in the US doesnt allow video calling to work over there 3G network? cuz if it was a phone thing it wudnt work over here too but it does. btw u might prolly think wtf im doing in here ? well i just come on here everyday and also go to phone arena to check out cellphones from the US cuz im a cellphone geek .. so yea .. I don’t care about video chat…I want my phone to quit randomly rebooting during phone calls! So sad to hear that. Why not just get a replacement from the one year warranty? What happens if someone steps outside their WiFi zone? Duh . . . no more WiFi? I did not receive OTA update for 2.3.3, will I still be eligliable to jump from 2.3.2 to 2.3.4? It seems that T-Mobile does not allow this to be used over 3G…what a shame.